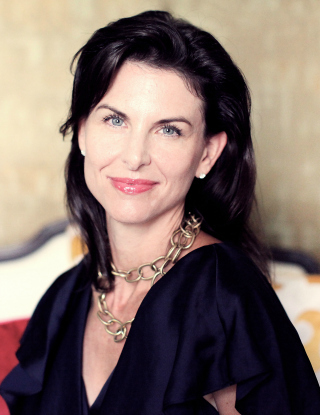 Shelly Lloyd took a circuitous route to her career as an interior designer, discovering along the way that her fashion acumen, passion for art, and globetrotting translated beautifully into creating sophisticated, authentic interiors with unexpected twists. And she has graced many a Midland home with her talented design. In fact, it was a Midland resident who introduced us to Shelly, who lives in Dallas but spends as much time in Midland as she can. Need more proof that the apple doesn’t fall far from the tree? Then you’ll appreciate this lovely write-up of legendary Dallas interior designer Emily Summers in Architectural Digest. 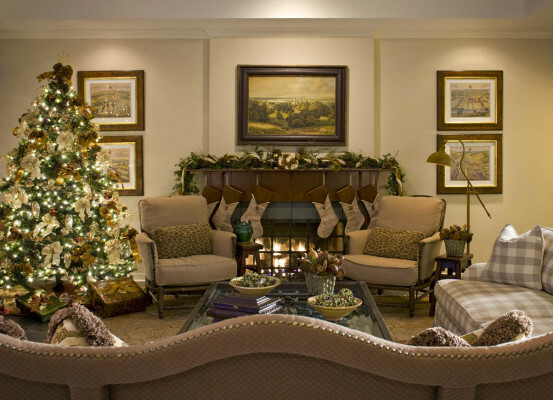 These stockings were hung by the chimney with the utmost care, considering that this Old Preston Hollow living room was decked out by Chambers Interiors. Headed by interior designer Margaret Chambers, this firm works hard to infuse clients’ homes with tasteful and timeless design. When a design client asked Chambers Interiors to decorate her home for the holidays, Allen Keith says they knew the traditional red color scheme wouldn’t wash with the client’s furniture. 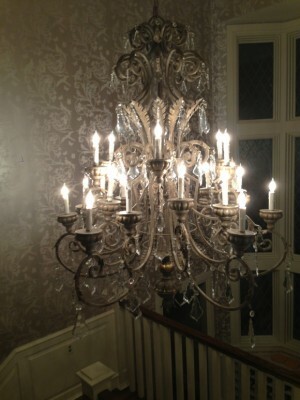 Likewise, Keith says they used a lot of copper and ivory, creating warmth and sparkle while keeping the decor inviting. The ribbons on the tree and stockings, along with the evergreen garland on the mantle, blend seamlessly with the upholstery and paint. Have an amazing holiday design you want to share with the world? Send us your snaps to jo@candysdirt.com. Who hasn’t loved the romance of the heaping ladle of stew coming from the burnished copper soup pot? 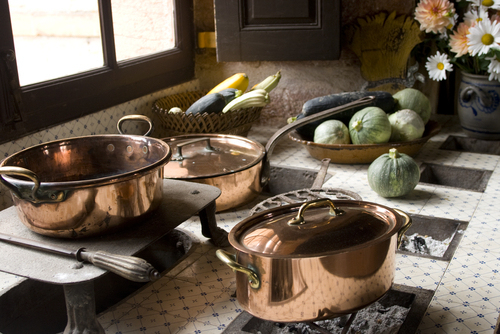 Copper pots are a sign of excellent taste — in both design and cuisine. True, copper has been used for cooking vessels for ages, making its way into the sculleries of nobility to make broths, tea, and so much more for the truly royal. 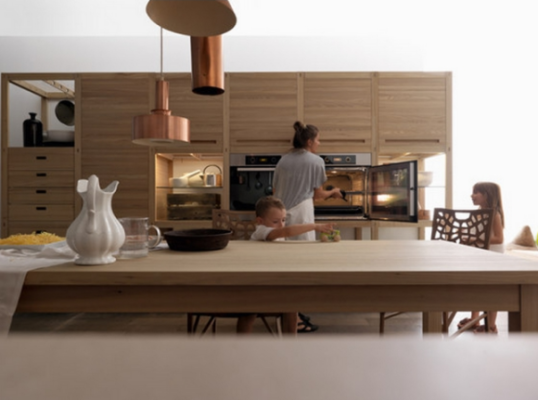 For anyone looking to add a bit of luxury to their kitchen, Schaeffler suggests adding copper. Whether utensils, lighting, or wall decor, copper can make any kitchen look like a work of art. “For those of you who do not like to cook but love design, vintage copper pots and pans are fun in any kitchen,” Schaeffler says. To find out more about what inspires Bernadette by browsing the newly redesigned website for the Bernadette Schaeffler Collection today. The upcoming holiday season likely will bring a guest or two to stay in your home for a few days. 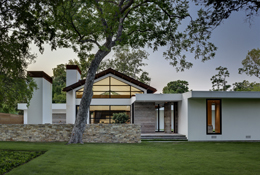 You have some time to create an inviting guest retreat that ensures your family and friends feel both welcome in your home while being able to escape to their own personal retreat to unwind. So, as you contemplate your guest room, follow these suggestions to ensure that your guests have a truly first-class experience. 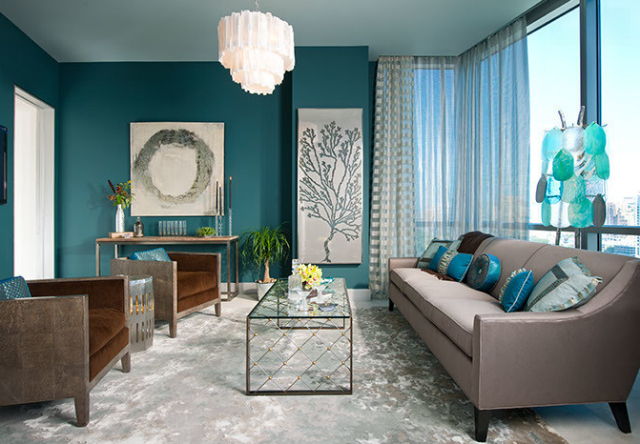 Make sure the room has a beautiful, well-thought-out color scheme and design that flows with the rest of your home. 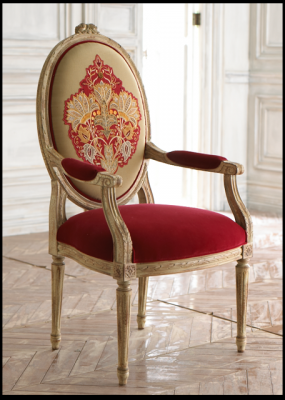 The style of furnishings should complement the furnishings throughout – not be filled with your first apartment’s leftovers! Be sure to employ proper light fixtures in the room for reading in a bed or working at a desk on a laptop. Also, provide enough lighting at the bathroom vanity to allow guests to see when putting on makeup, shaving, etc. And, of course, don’t forget a night light. A queen-sized bed is typically perfect for most guest rooms, but my favorite is using a pair of twins. It’s just more practical if you are hosting two guests who don’t know each other especially well. However, a trundle bed is often ideal for a small room. 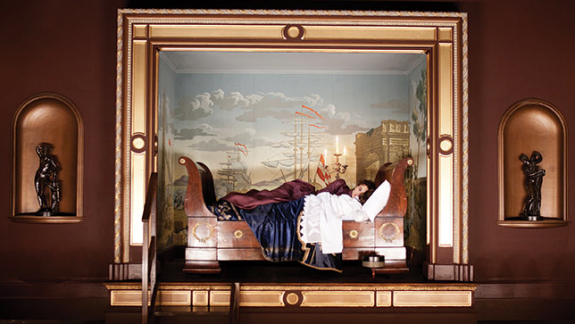 I love to use unusual beds, often with an antique canopy and interestingly shaped and upholstered headboards. You don’t want to buy a suite of furniture. It looks boring and doesn’t display a personal touch. Mixing finishes and styles is a more unique way to go. You’ll never see a matching suite of furniture in a major interior-design magazine as a featured article; only in an advertisement for a national furniture maker. 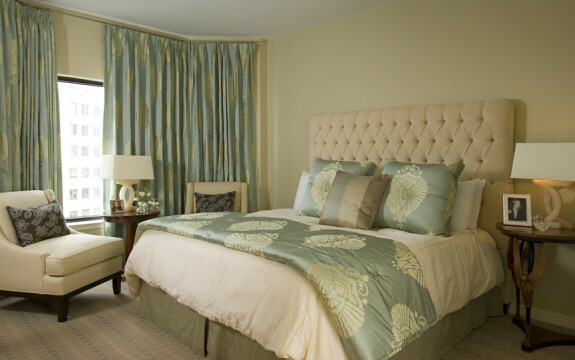 Utilize efficient window treatments to block out the morning light. Also, include lots of amenities, such as a bowl of fruit and iced-down bottled water, fresh flowers and, perhaps, a small coffee maker accompanied by a fragrant roast. You might consider including a few things they are likely to forget: an extra toothbrush, shaver or hair dryer. Be sure to clean out the closet, dresser and night stand, so your guests have ample room for their belongings. 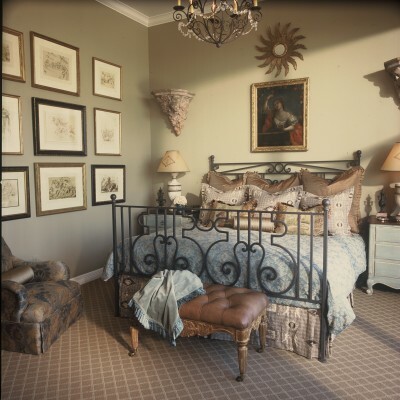 Another nice touch to have in a guest room is a little sitting area for morning coffee and the latest magazines and newspapers. If a space is available and you are building a new home, include a warm inviting fireplace and an armoire for a flat-screen TV. 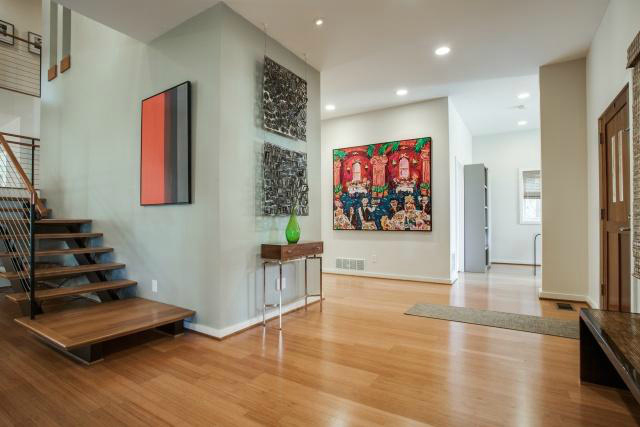 I am still not a fan of mounting a TV directly on the wall as if it were art – even in contemporary spaces. Creating a guest room is an opportunity to let your imagination fly. This is a room where you don’t have to please a spouse or a child. 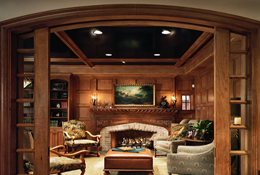 Create a fantasy room, a room that is unforgettable to your guests and one that you can enjoy from time to time. 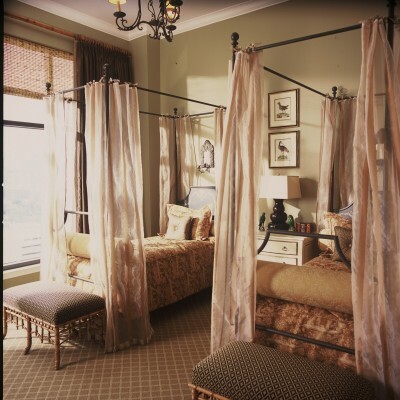 I would also recommend staying a few nights in the room yourself to see how the guests will experience their stay. 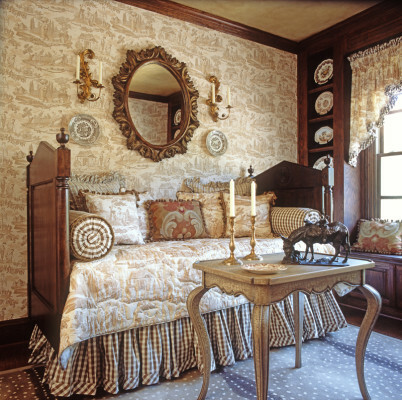 When it comes to designing a great guest room, the only limit is your imagination. Some people feel like gold is dated. Not Bernadette Schaeffler. 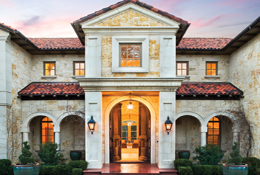 The Dallas interior designer feels that gold never went out of style. Nothing is more evident of this than the recent box-office success of Anna Karenina, Schaeffler said. There’s plenty of old-word sophistication that Schaeffler feels could ad a touch of luxury to modern life. It may not be the most convenient era, but it definitely has a hold on the designer.